"The Flame Pearls Pt.6: The Witch of Tago" is the 19th Mandrake Sunday story. The story was written by Lee Falk and drawn by Phil Davis. 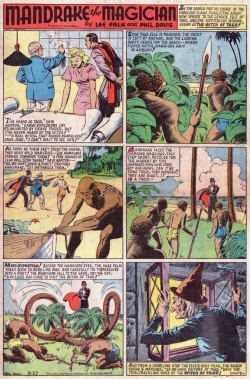 Mandrake is on a scientific expedition to the South Pacific, looking for flame colored pearls. Now they have reached the remote isle Tago, inhabitated by fierce tribes and a mysterious woman known as The Witch of Tago. June, daughter of Colonel Barton. Daughter of The Witch of Tago. Granddaughter of The Witch of Tago. The main title for this story is taken from the strip of April 14th, 1940 (Next Week: "The Flame Pearls"), while the sub title is lifted from the plot. The "Flame Pearls" story is a retelling of an ancient Greek myth; "Jason and the Golden Fleece". This page was last edited on 26 May 2016, at 05:33.